Know and understand Jesus just as Mark knew Him – nothing that people expected, but more than any of us could hope for. This is exactly what happens in the second half of Mark's Gospel. Jesus is the King. But He comes to serve and suffer, not to fight political battles. He is Israel's Messiah. But He comes to judge those who believe they are already God's people. He is the promised Rescuer, but He can't even seem to save himself. Rejected by religious leaders, deserted by His followers, it seems everyone is missing who He really is. Could we make the same mistake as the people of Jesus' day? This Good Book Guide will help you to know and understand Jesus, just as Mark knew Him - nothing that people expected, but more than any of us could hope for. I was happy to find the good book website and the rich choice of Bible study material. I ordered several study guides and other material. 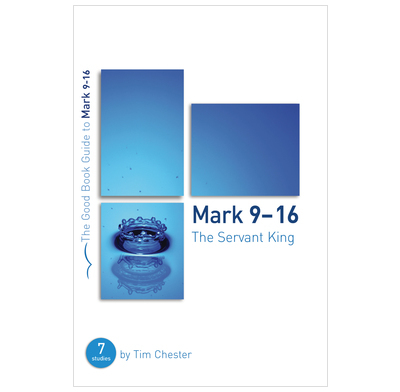 As Lent was approaching, I chose to start with this seven week study on the Servant King. Mark has always been my favourite Gospel. To go through 8 chapters in seven weeks is a challenge. especially for our study group. However, in the end it seems to work out surprisingly well. I use the study guide together with two other resources to put together the study framework. On its own, I find the study guide lacking depth, and some parts would definitely need more background material. But all in all, I am grateful to have found this material and will continue to use more of the material of this series in the future. Good study material. However I felt study 4 was unhelpful and I rewrote the material under the heading of the Hidden Kingdom rather than the Hidden King. The passage raises some really difficult issues and I thought the set study didn't really tackle them in the best way; indeed Jesus isn't a hidden king, but the coming of it could be described as secret. Happy to let you have my study questions and notes if that would help if you thought to rewrite that one. This study has given us a good framework and different approach to a familiar Gospel. Each week we found we had been led into useful and personal discussions on our faith, and benefited from it. Our home group has really enjoyed this study and as a leader I have found it to be easy to use and to prepare the study. We used this book to lead our cellgroup through Mark this term. It was well received though we felt it had some questions which children could answer and others at which we were quite out of our depth!